I recently had the opportunity to review the Kanex Mini Bluetooth Keyboard with Stand Cover, and I am impressed. Inside the box are the keyboard itself, a magnetic cover (which doubles as a stand for your tablet or phone), and a USB charging cable. 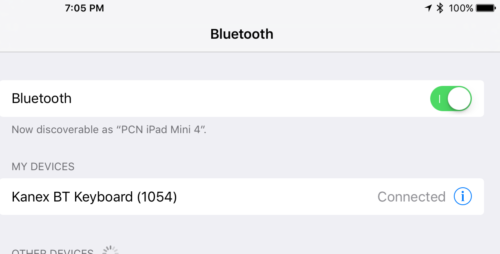 Pairing I the keyboard with my iPad Mini 4 was a breeze, as the keyboard appeared immediately in the iPad’s Bluetooth settings. I also paired the keyboard with my iPhone 5S to test, which worked a expected. I did have to make a few attempts to re-pair the keyboard with my iPad when I was done experimenting with the iPhone, as pairing with the iPad failed several times until I powered off the keyboard, told the iPad to forget it, and added it back as a new device. The keyboard itself performed very well, despite the fact that the keys are the size of Chicklets. Recall that it is the same width as an iPad Mini, so there isn’t a lot of real estate to play with. I did find myself occasionally hitting Enter when I was trying for other keys, and found the need to press the Fn key to get apostrophe and double quotes a bit odd at first, but I figured it out. Am I as fast a touch-typist on this as I am on a full-sized keyboard? Not even close. Am I a whole lot lot faster than using the iPad’s on-screen keyboard (either the Apple default or Google Gboard)? You betcha. However, if you have even slightly larger than average fingers, you can find yourself making a lot of typos, and at the whim of autocorrect to save you. Speaking of autocorrect, I found I was able to express myself fairly quickly and accurately with the Kanex. I was also amazed at how much faster it was for me to be able to Command-Tab from one app to another rather than double-clicking the Home button to open the iPad’s built in task switcher view. One thing that always takes me a little getting used to is the fact that there is no mouse or trackpad. For some reason, there is still a disconnect for me between typing on a physical keyboard, and having to touch the screen to select icons or menus. That said, the Kanex supports common keyboard shortcuts, like Shift-arrows for selecting text, and Command-X and V for cutting and pasting a selection. 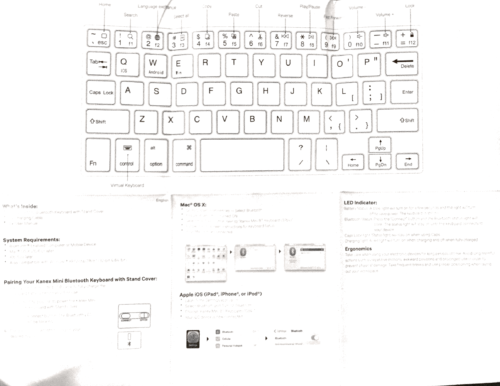 The Fn key also provides the ability to invoke several extended commands, such as switching back to the Home screen, cycling through apps with Command-Tab, and audio/video playback controls. 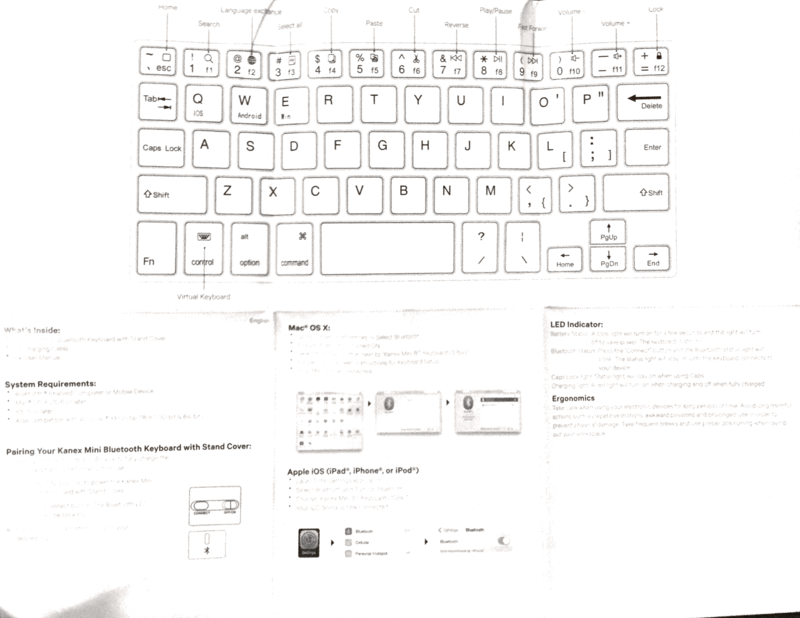 Including Fn key combinations, I was able to find all of the keys normally found on a standard 101-key QWERTY keyboard. Although it is fairly intuitive, the provided documentation (in English, Spanish, French, German, Chinese, and Japanese) does not show how to fold the case so as to function as a stand. There is a picture of it in stand mode on the box (which I did not notice, because I set the box aside as soon as I opened it). 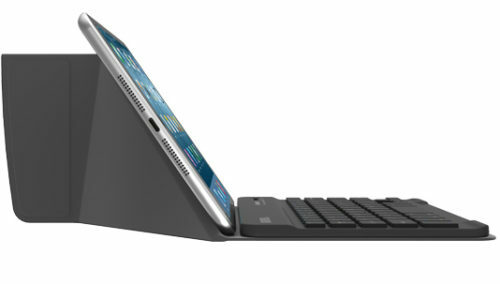 The cover itself magnetically sticks to the keyboard – which is brilliant – as well as itself, to stand up in a sort of tent on which to lean your tablet. You can easily separate the two pieces if you like, but they firmly adhere to each other for a stable typing experience, even when I have the unit on my lap. Also not documented are the Fn key options to invoke iOS, Android, or Win modes. I noticed that selecting iOS allowed me to use the special commands to return to the Home screen, Find, or even lock the iPad. As I didn’t have an Android or Windows device handy to test this, I presume selecting these key combinations issues the appropriate command dependent on what operating system you select. Kanex claims that the rechargeable battery will last for two months on a single charge. While I did not have any issues with the battery, I did not have time to put this two-month claim to the test. 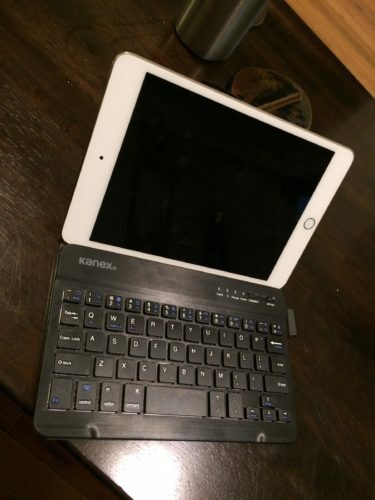 Overall, the Kanex Mini Bluetooth Keyboard – on which this entire review was written – is a solid offering, and worth a look if you are in the market (or if you’ve just been typing on an iPad Mini and haven’t yet realized that you’re in the market).